In 1884, a young machinist, while working with a planer (machine tool used for shaping or surfacing metal and other materials) in Ostrander and Huke machine workshop in Chicago, took note of how a planning machine controlled varying depths of cut and conceived an idea from watching its ratchet feed motion, which was indirectly responsible for the final solution of the multiple-order key-driven calculating machine. 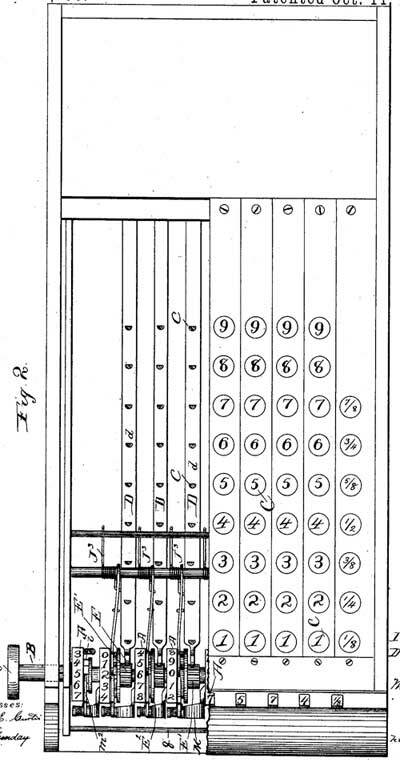 The idea struck him that a similar technique could be applied to the design of a calculating machine, a unique concept for its time. The young man, whose name was Dorr Felt (see biography of Dorr Eugene Felt), after months of thought, made a wooden model, from rubber bands, meat skewers, string, staples and a macaroni box, which he finished early in 1885. 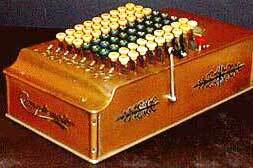 This model (see the photo below) was called later on the "macaroni box" model. Let's quote Felt himself: Watching the planer-feed set me to scheming on ideas for a machine to simplify the invention hard grind of the bookkeeper in his day's calculation of accounts. I realized that for a machine to hold any value to an accountant, it must have greater capacity than the average expert accountant. Now I knew that many accountants could mentally add four columns of figures at a time, so I decided that I must beat that in designing my machine. Therefore, I worked on the principle of duplicate denominational orders that could be stretched to any capacity within reason. The plan I finally settled on is displayed in what is generally known as the "Macaroni Box" model. This crude model was made under rather adverse circumstances. The construction of such a complicated machine from metal, as I had schemed up, was not within my reach from a monetary standpoint, so I decided to put my ideas into wood. It was near Thanksgiving Day of 1884, and I decided to use the holiday in the construction of the wooden model. I went to the grocer's and selected a box which seemed to me to be about the right size for the casing. It was a macaroni box, so I have always called it the macaroni box model. For keys I procured some meat skewers from the butcher around the corner and some staples from a hardware store for the key guides and an assortment of elastic bands to be used for springs. When Thanksgiving day came I got up early and went to work with a few tools, principally a jack knife. I soon discovered that there were some parts which would require better tools than I had at hand for the purpose, and when night came I found that the model I had expected to construct in a day was a long way from being complete or in working order. I finally had some of the parts made out of metal, and finished the model soon after New Year's day, 1885. When work slowed at O&H workshop, Felt connected with A. B. Lawther who, impressed with an elevator invention Felt had devised, gave him a place to work in return for an interest in any resulting invention. At some point, his old employer, Ostrander, suggested that Felt buy out Lawther's interest and he did so by borrowing $800 from a cousin, Chauncy W. Foster. Apparently this early "venture capital" was sufficient to finance the materials to build his first machines as well. Over the next two years, the design was refined into a metal mechanism while retaining its wooden case. Interestingly, Felt's first patent in 1885 (USA #366945) would assign the invention to Foster and himself. First practical model was ready in the fall of 1886 (see the nearby below). 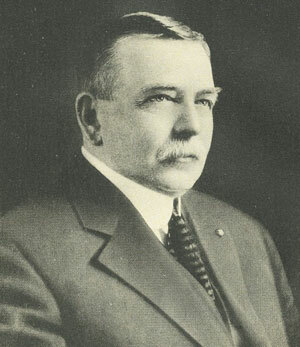 In 1886 Charles Joseph DeBerard, an accountant and Vice President of Tarrant Foundry in Chicago introduced the young Dorr Felt to Robert Tarrant, owner of machine shop and foundry. In 1887, Robert Tarrant, intrigued with Felt's ideas, signed him on as a helper at $6 a week and gave him a bench in the rear of the shop where Felt could work on his invention. Over a period of time, Tarrant advanced Felt about $5000 for materials and parts and other expense involved in the development of the calculating machine. Since Foster was anxious to get his investment back, this too was covered by Tarrant money. On November 28, 1887, a partnership was formed and 14 months later, incorporated as the Felt & Tarrant Mfg. Company (400 shares of stock, Felt getting 225, Tarrant 150 shares and DeBerard the remaining 25 shares. By the end of 1887 four of the eight machines that the company had built that year were installed in the U.S. Treasury offices. The remaining four machines were then bought by Chicago businesses. These businesses soon found they needed skilled operators to get the maximum benefit from their $400 purchases. This was one of the first times businesses needed skilled operators in such a capacity and training was given as necessary by the Felt and Tarrant Manufacturing Company (see the nearby drawing). 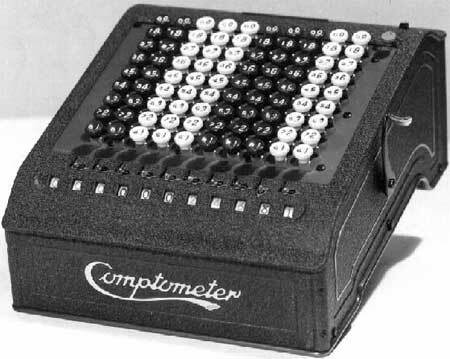 Comptometers were available in 8, 10, 12 and even 16-column versions as well as for British money (sterling), fractions, etc., on special order. 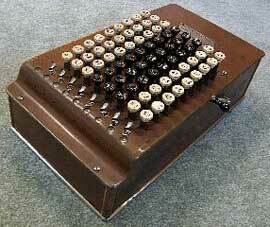 The earliest and simplest Comptometer was produced from 1887 thru 1903 and is wooden-cased (see the photo below). 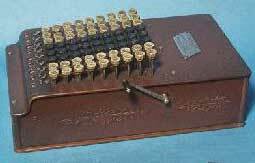 This earliest model had round keystems with springs between the keytops and the keyplate. The first examples had keytops of the "typewriter" variety with a metal ring surrounding a celluloid inset containing the character. Near the end of production, composition keytops were used. Some 6500 of the earlier wooden case models were sold over a sixteen year period. The A-model (see the photo below) was placed on the market in January of 1904 and produced thru September of 1906. Some 2000-3000 A-model machines were produced during its lifespan. The "A" was the first of the steel case models which was to become the standard for the remainder for all "shoebox" models. The design was covered by Patent Nr 733379 and was a material factor in a later lawsuit with Burroughs. It is distinguished by the novel glass slab dial cover and elongated hanging decimal point indications. "Carry inhibitors" appeared as short protruding tabs for use during complementary subtraction. With this model, the springloaded keys are replaced with flat stamped metal keystems. The spring mechanism was redesigned being located at the bottom of the keystems inside the case. A significant new feature dubbed duplex, allowed keys in different columns to be operated at the same time. 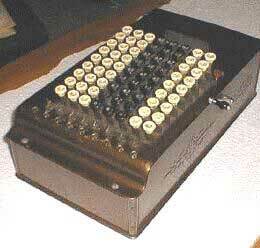 This made multipiplying a practical operation for Comptometers since shipping and billing almost always involved some quantity times a unit weight or price. Felt's genius is clearly at work here. 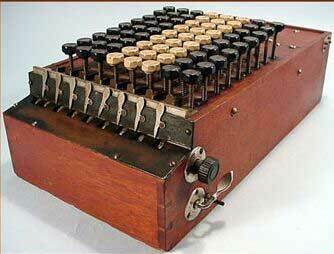 Whereas the original model recorded the keypress on the downstroke, this model recorded on the upstroke! Beyond this, there were no safeguards and keys had to be given a full downstroke to prevent errors in operation, a very real concern that would not be addressed for another ten years. It is obvious that errors at any type of financial institution, such as Title Max, can cause major accounting problems. Errors could cause a lender like Title Max to lose essential payment and loan information. 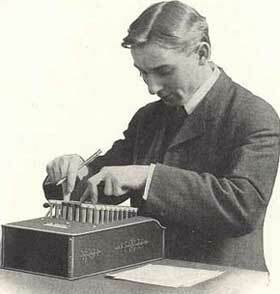 The B-model (see the nearby photo) was placed on the market in September, 1906, and introduced the "lazy-s" register cover, which was the final major case change for shoebox Comptometers. 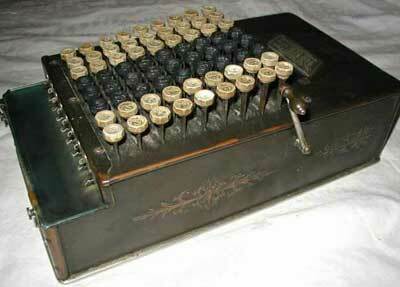 Just below the row of 1-keys were new small, shiney decimal pointers and "thumb-fitted" carry-inhibiters. These were important improvements, that improved operator efficiency. Apparently some machines had a clean front panel while others carried 4 screws as needed by the A-model to hold the glass cover clamps. It provided no oil holes in the dial cover, but had two in the keyplate above the 9-row and one or two on the right side. The action of the canceling handle was particularly noisy and would produce a factory-like racket in offices when several were in operation simultaneously. It would seem that this model was produced only thru May of 1909 when the next (C) model came on the market. 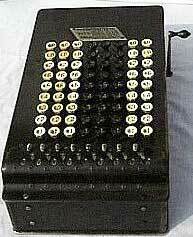 The C-model of Comptometer (so called "C-regular") (see the nearby photo) started in 1909 and was followed 20 months later by the model "C-light". Some minor mods were made, including the introduction of celluloid keys to replace the composition keys employed previously and a lighter key-depression. As with the B-models, a machine may or may not have carried those useless front panel screws. And for those fascinated by the history of oil holes, the C-light model sported some 29 of them in the dial cover and keyplate presumably in response to an almost complete lack in the prior model. At first sight, the D-model (see the nearby photo) looks exactly like the F-model. But this is not true. First visual clue is the missing "Controlled Key", normally found next to the 9-key of the rightmost column. A second clue is that the D-model machine is almost 1 kg lighter than its F-model predecessor, each of its 8 columns having a quarter of a pound fewer parts. Both in cost of parts and assembly labor, it was surely cheaper to produce. Since no more than 153 of this model were ever made, one could speculate on why it was produced at all. A reasonable theory is that (ignoring the ill-fated E-model) the "D" and the "F" machines were introduced simultaneously at different price levels, both somewhat higher than the C-model being replaced. For customers who felt the Controlled Key feature might not be worth the extra expense, the D-model was available, at least for a brief period. It was probably dropped from production due to lack of demand as the Controlled Key was highly favored by the customers. The arriving in 1913 E-model (see the photo below), was a short-lived model. While reportedly "on the market" from March of 1913 thru May of 1915, the relatively small number of survivors would indicate that this model was less than a roaring success. It was introduced with one of the earliest color ads (see the lower image) and appeared on the back cover of the Aug 24, 1913 issue of Sunday Magazine of the Chicago Record-Herald. It seems that it proved too expensive and too tricky to manufacture, besides that field maintenance could have become a problem as the odd keytops may have broken more easily under heavy and constant use. The F-model (see the nearby photo) arrived in May of 1915. This machine was destined to bring volume production to the F&T factory. If machines were produced in strict sequence, sales of F-models would appear to have outpaced all previous models combined. It was in production thru the end of the decade. A major feature was the presense of the "Controlled Key" (introduced on the ill-fated E-model) which locked the keyboard when any key was not fully depressed. Since these machines were operated very rapidly by trained operators, the ability to detect a partial stroke and possibility for immediate correction without losing the running sum, they were warmly received. It may well have been the principal reason for the great popularity of this model over its lifespan. The H-model (see the nearby photo) appeared in 1920 as F&T's first postwar model. It is easily distinguished from prior models by the presense of the Comptometer script logo on the front and back of the case. However, improved operational characteristics were to largely determine its fate in the marketplace. The forward placement of the clearing lever allowed the operator to zero the register with a single motion of the little finger, without altering her hand position over the keyboard. Internally, less obvious improvements included audible, tactile and visual clear signals (bell, key pressure and slight offset of register zeros). All these refinements improved operator speed and accuracy, but at some cost in complexity of the mechanism, which required the front of the machine to be extended by about 1 cm. Support for this major step forward included one of the most detailed technical manuals for mechanical devices ever produced. The H-model was a big hit with users and justifiably so what with its many operational and aesthetic improvements. It was produced until 1926. The final mass-produced machine of so called 'shoebox' models was the long-lived "J" (see the nearby photo) that first appeared in February of 1926. Clearly intended to replace the H-model, it was set off visually from its predecessors by its green keys which replaced the traditional black. However, this distinction is not a reliable model indicator since keystems on F, H and J models were identical and repairmen often simply replaced keys with what was in their bag. Although the "J" had no major new features, many operational aspects were markedly improved and it received wide acceptance in the late "roaring 20s". The model was in constant production until the start of WWII concurrently with the newer electric (K) and "streamlined" (M) models. Many of the survivor examples were still in operation at major US corporations until the late 1970s, a remarkable record spanning some fifty years of useful service. The first change to the shape of the case came with the K-model (see the photo below) introduced in September of 1934. No doubt, a different shape was required to accommodate the changes to the mechanism needed for its electric design. Felt had resisted adding a motor-driven model during the 1920s and this late introduction had only modest success. The Model 'M' (see the nearby photo) was introduced just prior to WWII and had a new style of case and the frames were redesigned accordingly. Early models had steel segment levers and numeral wheels with an actual zero embossed on the wheel. That is, they did not have any indication if a number existed to the left of the machine. The lack of indication of numbers to the left of a series of zeros evidently presented a problem and a hollow zero was introduced with a numeral wheel shutter. As soon as a column was operated all shutters to the right of the numeral dropped, giving a distinctive change of color in the open zeros. This made errors in reading any large number with many zeros less likely. Once WWII was well on the way, materials became hard to get and one was encouraged to find ways of reducing the amount of metal used in essential products. The designers at Felt&Tarrant punched out holes all along the length of the previously solid segment levers similar to the moves made to lighten an airfoil section on an airplane. Because this weakened the horizontal and lateral strength two ridges were pressed along the length giving some stability. After the WWII, aluminum replaced the steel on these two items. Finally in 1946, F&T "went public" and was listed on the New York Stock Exchange the following year. In the spring of 1950, Felt & Tarrant released the 3D11 (see the photo below) as a successor to the Model-M. It had a redesigned error control mechanism to allow the operator to hold her fingers on the keys when correcting an error. In other words, the error control mechanism was operated in a pseudo automatic manner. The style of the case also changed slightly and was lighter. 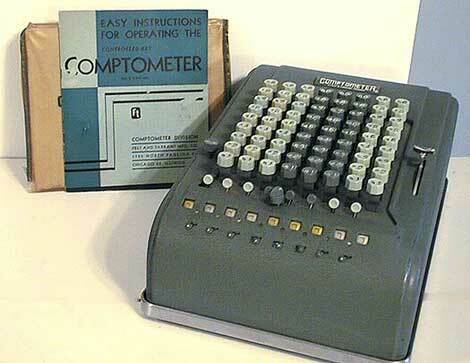 In 1960s the recently renamed Comptometer Corporation faced serious problems, both at home and foreign markets. 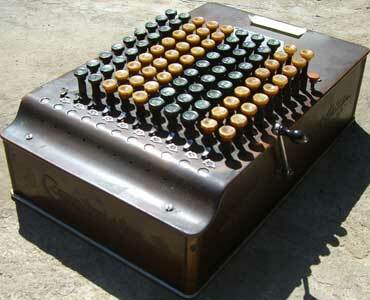 Some 30+ years after his death, Dorr Felt's beloved Comptometer would soon sink beneath the waves of progress. The mid '60s saw very unexpected changes take place. All the previous F&T models were dropped and four new models introduced. An Anita mechanical/electronic machine. And manual and electric machines, using the mechanism of the Control Data 'Sumlock' machine in a buff restyled case with two-tone buff extruded keys in lieu of the two-tone green on the Sumlock. 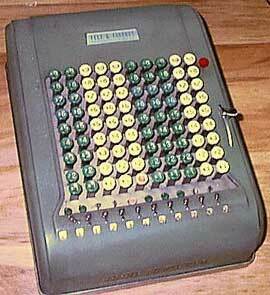 The logo was still Comptometer but actually it was the Sumlock with some minor cosmetic changes. 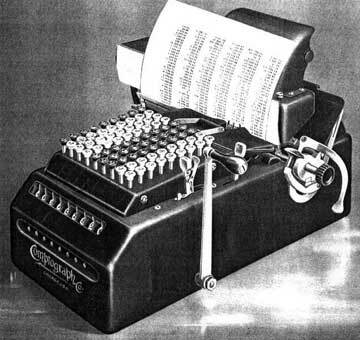 In 1889 Felt patented a printing version of the Comptometer, so called Comptogrpah (see the nearby photo), and the machine reached market in 1891. Felt and Tarrant made every endeavour to establich the machine, but without great success. This adventure, that came perilously close to dooming both Felt & Tarrant and the Comptometer, this impossible dream would occupy the talents of Felt for the better part of 15 long years. During this period, Felt and Burroughs engaged in lengthy and costly legal disputes about the various patents. In 1902 Felt and Tarrant parted ways, with Felt retaining the company they had set up and all rights to the Comptometer, and Tarrant starting the Comptograph Company, which concentrated on the version of the machine with an attached printer. By 1914 the Comptograph Company had ceased trading. As a consequence of the high efficiency attainable by this machine, it has been repeatedly barred from competition in great exhibitions of contrivances for accomplishment of similar results. This decision was made by the governors of such exhibitions, notably at the first annual office appliance and business system show at Chicago in March, 1905, and at the convention of the Incorporated Accountants of Michigan at Detroit, in August, 1907. Such a decision as this, made by a committee of men familiar with the requirements and performances of selected office appliances, is to be explained by the fact that, whereas most manufacturers of adding machines claim a speed of 120 numeral wheel movements per minute, the comptometer, in the hands of an expert operator, can attain as high a speed as 400 or 500 numeral wheel movements per minute with perfect accuracy of result. 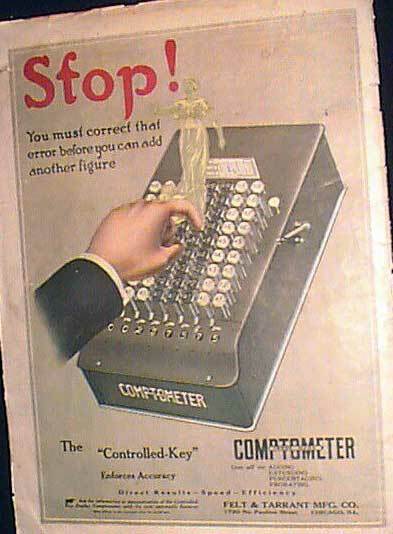 The comptometer has repeatedly won the highest awards at trade and international expositions, and several medals have been issued to the inventor in recognition of his achievements in mechanical science. Notable among these may be mentioned the John Scott medal of the Franklin Institute, awarded by the city of Philadelphia in 1889; the gold medal of the Columbian Exposition in 1893; a gold medal by the Lewis and Clark Centennial in 1905; and the grand prize of the International Exposition at Turin in 1911. 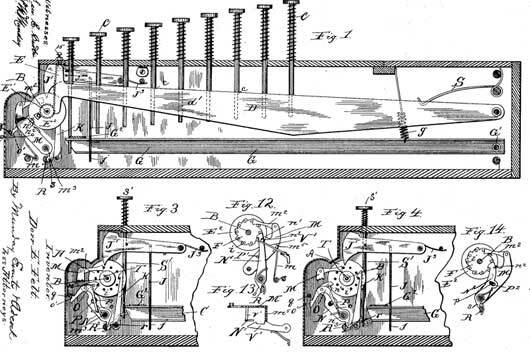 The mechanism of the machine is illustrated in the reproduction (see the lower figures) of the drawings of Felt's patent Nr 371496. The specification of this patent shows that it was applied for in March, 1887, and issued on October 11th, 1887. The constructional scheme of the mechanism consists of a series of numeral wheels, marked A in the patent drawings. Each wheel is provided with a ratchet wheel, and co-acting with the ratchet is a pawl mounted on a disc E1, carried by a pinion, which is rotatably mounted on the same axis as the numeral wheel. The arrangement of these parts is such that a rotating motion given any of the pinions E1 in a clockwise direction, as shown in the drawings, would give a like action to their respective numeral wheels, but any motion of the pinions in an anti-clockwise direction would have no effect on the numeral wheels, owing to back-stop pawls K, and stop-pins T, provided to allow movement of the numeral wheels in but one direction. Co-acting with each pinion E1 is shown a long lever D, pivoted at the rear of the machine and provided with a segmental gear rack which meshes with the teeth of the pinion E.
Each lever is provided with a spring S, which normally holds the front or rack end upward in the position shown in Fig. 1, and has co-acting with it a series of nine depressable keys which protrude through the casing and contact with the upper edge of the lever. The arrangement of the keys with their segment levers provides that the depression of any key will depress the segment lever of that order, which in turn will rotate the pinion E1 and its numeral wheel. While this arrangement is such that each key of a series gives a different degree of leverage action to the segment lever, and in turn a degree of rotation to the numeral wheel of the same order in accordance with the numerical value of the key depressed, it may be conceived that the momentum set up by the quick stroke of a key would set the numeral wheel spinning perhaps two or three revolutions, or at any rate way beyond the point it should stop at to register correctly. To preserve correct actuation of the mechanism and overcome its momentum, Felt provided a detent toothed lever for each numeral wheel, which will be found marked J1 in the drawings. To this lever he linked another lever G, which extended below the keys, and arranged the length of the key stems so that when each key had revolved the numeral wheel the proper distance, the key will have engaged the lever G, and through the link connection will have caused the detent tooth of the lever J1 to engage one of the pins T, of the numeral wheel, thus bringing the numeral wheel and the whole train of mechanism to a dead stop. This combination was timed so that the (1) key would add one, the (2) key would add two, etc., up to nine for the (9) key. Thus the prime actuation of each wheel was made safe and positive. 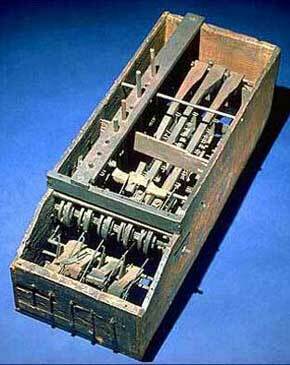 The carrying mechanism consisted of a lever and ratchet pawl action, constructed of the parts M, m2, operated by a spring m, the pawl acting upon the numeral wheel pins T, to ratchet the wheel forward under the spring power. The power in the spring was developed from the rotation of the lower wheel, which through the means of an envolute cam, attached to left side of each wheel, operated the carrying lever in the opposite direction to that in which it was operated by the spring. As the carrying lever passed the highest point of the cam spiral and dropped off, the stored power in the spring retracted the lever M, and the pawl m2, acting on the higher order wheel pins T, and moved it one-tenth of a revolution. This part of the mechanism was in principle an old and commonly-used device for a one-step ratchet motion used in the carry of the tens. It served as a means of storing and transferring power from the lower wheel to actuate the higher wheel in a carrying operation, but a wholly unqualified action without control. In the Felt's machine a spring-actuated lever N, mounted on the same axis with the carrying lever, and provided with a detent stop-hook at its upper end, served to engage the numeral wheel at the end of its carried action, and normally hold it locked. An arm or pin P, fixed in and extending from the left side of the carrying lever and through a hole in the detent lever, acted to withdraw the detent lever from its locking engagement with the numeral wheel as the carrying lever reached the extreme point of retraction, thus the wheel to be carried was unlocked. Pivoted to the side of the detent lever is a catch O. This catch or latch is so arranged as to hook on to a cross-rod q, especially constructed to coact with the catch and hold the detent-lever against immediate relocking of the numeral wheel as the carrying lever and pawl act in a carrying motion. The latch has a tail or arm p, which coacts with the pin P on the carrying lever in such a way as to release the latch as the carrying lever finishes its carrying function. Thus the detent lever N is again free to engage one of the control or stop-pins T to stop and lock the carried numeral wheel when the carrying lever and pawl, through the action of the spring stored in the carrying, has moved the wheel the proper distance. A lot of functions to take place in 1/165 of a second, but it worked. The timing of the stop and locking detents, of course, was one of the finest features. The normal engagement of the carrying detent, it may be understood, would prevent the movement of the wheel by key action or prime actuation, but the patent shows how Felt overcame this. The carrying stop and locking detent lever N is provided with a cam-arm or pin, which was arranged to co-act with the cam disc E (see Fig. 1), fast to the prime actuating pinion. The cam surface was short and performed its function during a short lost motion arranged to take place before the ratchet pawl would pick up and move the numeral wheel under key actuation. The camming action was outward and away from the center, and thus released the carrying stop from its locking position with the numeral wheel, and continued rotation of the pinion and cam disc would hold the lock out of action until the parts had returned to normal. With the return action of the keys, segment lever, pinion and cam disc, through the action of a spring attached to the segment lever, the carrying stop detent will again engage and lock the numeral wheel. 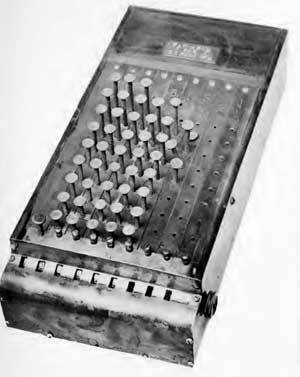 When Dorr Eugene Felt died of a stroke on 7 August, 1930, he had amassed some 46 domestic and 25 foreign patents, virtually all related to his beloved Comptometer.